The Mackinac Center’s role in bringing workplace freedom to millions brought a small contingent of union protesters to Midland just days before the U.S. Supreme Court heard oral arguments in the landmark case Friedrichs v. California Teachers Association. According to a press release sent by Progress Michigan on behalf of the Service Employees International Union, the Jan. 7 protest was a direct response to the Mackinac Center’s work in making Michigan a right-to-work state, as well as its support of the Friedrichs case. That case could give public employees across the country the freedom to not pay union fees as a condition of employment. 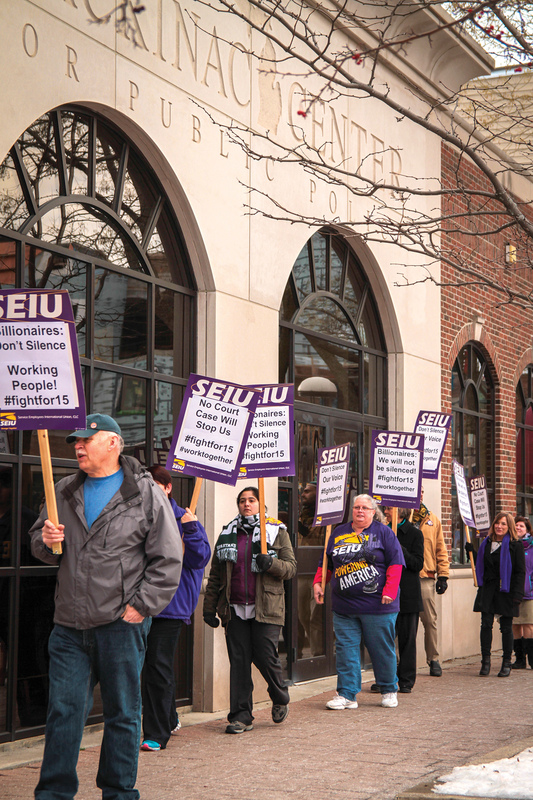 Mackinac Center Executive Vice President Michael Reitz said in a statement to the media that the SEIU protest was a fitting nod to First Amendment protections, which the Friedrichs case is ultimately about. “Just as people are free to protest under the First Amendment, the Mackinac Center believes teachers should be free to choose what political organizations they want to support, which is the central issue in the Friedrichs case,” Reitz said. Reitz went on to remind the media that the SEIU took over $34 million from home health care workers, many of them simply looking after family members, by unionizing them without their knowledge or permission. About 10 people paced the sidewalk outside the Mackinac Center’s Main Street entrance in downtown Midland for just under an hour. Most of the signs urged raising the minimum wage to $15 an hour and said nothing of Friedrichs, unionism, or the Center. The Midland Daily News and MLive covered the protest, which Reitz said is a testament to the impact the Mackinac Center is having even beyond Michigan. 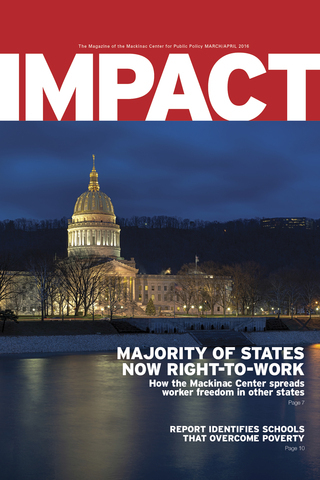 In the Friedrichs case, the Mackinac Center Legal Foundation submitted two briefs in support of the plaintiffs. It also has been a leading source of information on the case and the possible effects of expanding worker freedom to public employees in non-right-to-work states. Additionally, the Mackinac Center created a Web page and produced a video to provide information to the media, public and other think tanks. Other employees also participated in numerous local and national interviews on the case. Unscathed by the protest, six members of Mackinac Center’s executive, legal, policy and communications teams, along with board member Richard Haworth, traveled to Washington, D.C. to hear oral arguments in the case, rally on the courthouse steps, speak with members of the media and support teacher Rebecca Friedrichs and her fellow plaintiffs.